My editor is loading correctly today, so I figured I had better hurry up and post some pictures while I had the chance. These pictures are from a nature walk Katydid and Farmerboy took back in January. Squirrel nest? Or an old bird nest? Topped with a dollop of snow like whipped cream. Proof that the holes were quite new. Deer damage or porcupine damage? It looks a bit too serious for deer to me. I can't tell if this is a mouse hole in the snow or a place where rabbits have been digging for food. All photos by Katydid (of course). We're all still sniffling, but on the mend. As you can see, my mending hasn't extended to my ability to come up with catchy or meaningful titles. Or catchy or meaningful blog posts. I subscribe to the Cornell Lab of Ornithology's Twitter updates, and this morning they sent through a link to an expedition to New Guinea undertaken by members of the California Academy of Sciences. Katydid maintains that when she grows up, she is going to study birds of paradise in Papua New Guinea -- thus the title. And also, thus my pleasure at finding such a nifty link to Papua New Guinea. Do explore the link -- gorgeous pictures of caves, birds, bats, arachnids, and snakes. I'm addicted to the Seven Quick Takes post now, so I'm going to post one even though I'ma little late. (I started this one yesterday.) Go see Jen for more! I cooked a 21 lb. turkey for Thanksgiving. It was the biggest turkey I have ever seen. We didn't need a 21 lb. turkey -- there were only 10 of us, our 8 plus Grandma and Grandpa -- but we bought our turkey fresh from a local farm, and that was what they had. Enormous turkeys. I actually bought a roaster this year because I knew the turkey was going to be big, but the lid still wouldn't close. I baked the turkey in an oven bag inside the roaster with no lid instead. Please don't tell me about all the carcinogens with which I infected my pastured turkey. I am blissful in my ignorance. Next year we have decided to raise our own turkeys. We just have no clue how to do this. Turkeys, I hear, are a lot more skittish than chickens. Also, it appears that they may be less intelligent than chickens. (How an animal could be less intelligent than a chicken, I have no idea.) There are not as many varieties of turkey to choose from as there are chickens, largely because factory farming has selected for ONE breed -- the Broad-breasted White -- which has white feathers for easy plucking and cannot mate because it is soooo heavy. We'd prefer to conserve one of the few other remaining breeds, but which one? The Bourbon Red? The Naragansett? The Royal Palm? It seems that mail order turkeys have a 15 minimum order. Do we really need 15 turkeys? Where would we put them? Would we try establish a breeding flock? Are we going to need an extra freezer? Thanksgiving suddenly seems a lot more complicated. Sweet Potato Souffle is the absolute best way to eat sweet potatoes. Just remember to call it a "souffle" and not "pie filling." "Education comes third because it is useless to attempt education with people sick physically and mentally from deficiencies of vital minerals. It is no good trying to solve the problem by taxes, WPA, charity and relief, although these may be necessary in times of acute crisis." Reba is off for the week end in Mt. Vernon so Tom and Nancy cooked lunch aided by bits of advice, some corn-husking and potato-paring by the rest of the family. And a good lunch it was -- young White Rock broilers, mashed potatoes, gravy, cauliflower and sweetcorn fresh from the garden, quantities of fresh butter churned Thursday, tomatoes like beefsteak and the first limestone lettuce, newly made peach butter and freshly made pickles put up by Nanny and Jenny Oaks, ice-cold cantaloupe watermelon, big bunches of Niagara and Concord grapes and fresh peaches, ice-cold glasses of Guernsey milk or fresh buttermilk with little globules of butter still floating in it. Everything on the table was produced on the place. To which I replied, "Good grief, that was lunch???" Thanksgiving has, I think, become more meaningful to us as we have attempted to put more of our own food on the table. This year we had our own sweet corn, Gareth's green beans, our onions, and our potatoes. One of our own eggs went into the sweet potato souffle. (Ahem.) We had a local turkey, local garlic flavoring the turkey, local sweet potatoes, blueberries picked from a local farm in a blueberry-cranberry sauce. During the week we had pumpkin bread made from our pumpkins and yellow squash bread made from our squash. We had whipped cream made from fresh local cream on our pumpkin pie. It was a meal that tied us to our place, a thanksgiving for our harvest, and the harvest of other farmers in the area... a harvest which is keeping those farms afloat in difficult times. Raising that food was a lot of hard work, for us and for others. It was a lot of dirt and weeds and bugs, and chickens messing up the front steps. Was it worth it? Well... yes, yes, it was. Yes, it is. The night nurse who took care of me and the twins when they were born dubbed one of them "The Complainer", because he fussed A LOT. He didn't cry for hours on end; he just "complained". Now that he is three he throws from 1-6+ fits a day over anything which is impossible. For instance, the other day right before his nap we were reading a book that had pictures of strawberries in it. "I like strawberries," he said. "Me, too," I replied. "We'll eat strawberries again in the spring." "I want to eat strawberries RIGHT NOW!!!" 0 to temper tantrum in 5 seconds. But as long as you remember that he will throw a fit about anything as long as it is impossible, this particular behavioral trait of his becomes an amusing quirk and not a source of endless frustration. Last night he was complaining about something and my husband looked him in the eye and said, "We can't go to Mars." Immediately he stopped complaining about whatever it was and switched gears. "I want to go to Mars!" he sobbed, throwing himself backwards on the couch. There's a stack of catalogs on my dining room table right now. I've weeded through them and thrown away most of them already, but still the stack is a big one, reminding that 'tis the season to remember that I can't go to Mars either. There's not room for a 3-stage booster rocket in my house. and the Nature Blog Network has a huge list (440) of nature blogs, of which Zooillogix is the most fun -- and probably the most addictive. How can you resist entries about a dog that emits high-pitched radio signals from its ears or"worm-grunting"? 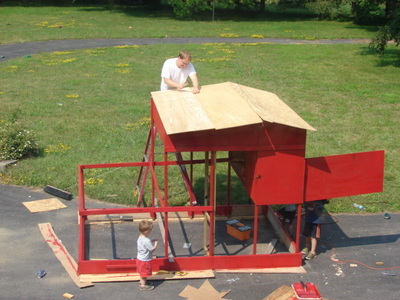 I've been calling this thing a "chicken coop", but it is in reality a "chicken tractor", meaning that we can move it. The only problem? It is not suitable housing for an upstate winter. So we still have to figure out something for that. Andy finished building it on Saturday -- all but the nest boxes, which we don't need yet, and a good ramp for the chickens to get to the roosts. We actually got the plans off the Internet, but now I can't find them to link for you. We have 13 chicks and a really extensive predator list (bears, coyote, skunks, raccoons, hawks, possibly weasels, dogs... Andy is pretty sure he saw a lynx once, too), so we needed something that would give them all enough room and keep them safe. We're planning to let them free range during the day, but friends of ours who have chickens tell us that 11-2 is "hawk time". 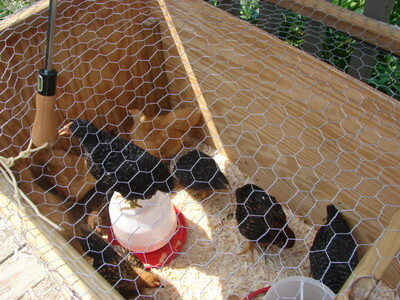 So, until they're bigger, we're keeping them in the coop/tractor during those hours. All the open spaces are covered in chicken wire. The chickens awaiting their new digs. That's the handle of an umbrella, by the way. It was hot, and they needed some shade. ... that starts out with your daughter's pet rabbit being eaten by raccoons, and then proceeds to the minivan breaking down, the kitchen sink clogging, your husband informing you of all the traveling he'll be doing during the most hectic months of the year (that would be July and August here in the Great White North), and ends with a bad case of allergies and your normally mild-mannered five year old having a complete and total meltdown because his older siblings won't let him play a Star Wars game? Poor Katydid. Her headache has still not gone away, and she was the one who found the remains of her rabbit. 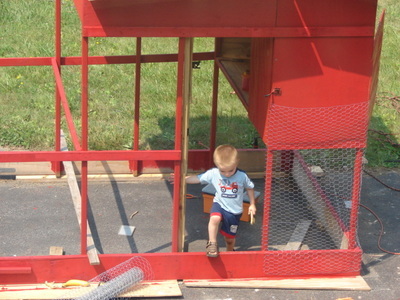 We woke up Monday morning to find the hutch flipped over and the rabbit gone. Originally, I thought the culprit might have been a coyote, but when we found what was left of the bunny, it was pretty clear that it was not. A coyote would have eaten most of the rabbit. Raccoons do not. 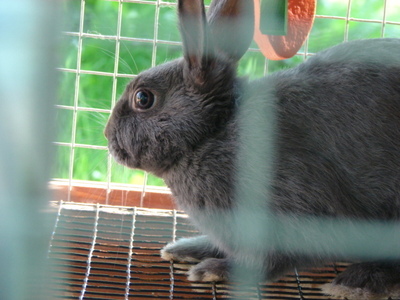 We spent a few bad days, but she cheered up considerably when the friends who gave us the rabbit gave us some advice on how to raccoon-proof the hutch and offered to give Katydid another rabbit. We'll work on the hutch this weekend -- anchoring it to the ground, basically, and installing a latch on the lid -- and hopefully in the next couple of weeks, she'll have another bunny. As for the other stuff (which is pretty small potatoes when compared to a sad child whose head has hurt daily for the past two months), Andy called a plumber this morning, we're eating McDonald's for lunch because we can't run the dishwasher, and I can't really do anything about the hectic-ness because I want my kids to be able to play soccer and take interesting classes at the art museum. So I'm just going to have to buck up for a while. The good news is, tomorrow is the Fourth of July, which means that this week ends early -- thank goodness! Katydid's new rabbit, Zita. She's a Blue Polish, very calm. We got her from another family in our homeschool group. They breed rabbits but have been trying to reduce their numbers lately, so they happily passed on this one. They gave us the grand tour of all their chickens, ducks, turkeys, tadpoles, and rabbits on Monday, and we had a great time. Katydid named her bunny for St. Zita, whom she looks to for help in doing her chores without distraction. 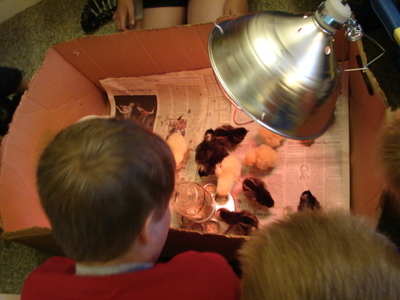 Our chicks arrived in the mail today. 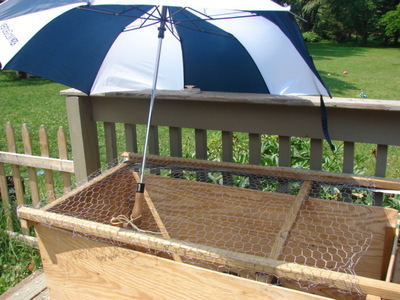 I ordered 5 Dominique hens, 5 Buff Orpington hens, and 5 Gold-Laced Wyandotte hens from Meyer Hatchery. 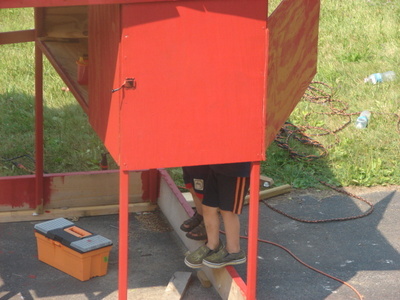 Andy had built a brooder out of wood, but we thought it was a little big for such tiny chicks. So we used the traditional cardboard box. Unfortunately, we had an accident not too long after I took this picture, which resulted in two of the chicks being crushed and killed. Needless to say, this was quite traumatic to everyone involved. I did not plan on starting out our chicken adventure with a lesson on the uniqueness, preciousness, and irreplacibility of life. In fact, I wish that all lessons involving nature were as beautiful as watching my roses and peonies swelling in their buds, and I am the kind of person who is likely to get up several times tonight (I'll be up several times tonight anyway) just to make sure that the remaining thirteen chicks are all right. 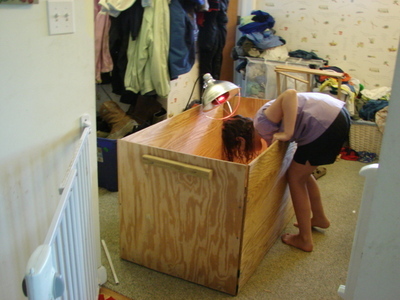 We did move the chicks to the wooden brooder right away, which is working much better. So our introduction to hobby farming has been a little rough, and I am wondering if I shouldn't become a vegetarian. 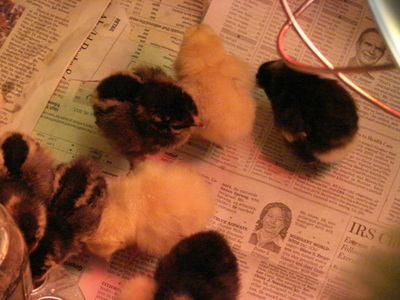 Overall, though, I think it's already been worth it to bring these little chicks into our home. But I also wonder, do other people say Hail Marys for their chickens?? ?